We went to McDonalds today. We don’t normally dine-in at McHeartAttack but LJ was very upset that we took him away from the park where there were some fun Children’s Week activities so to make it up to him we went for some McNuggets. As soon as we walked in, the mess hit me. On every empty table were the leftovers of recent patrons who felt that it would be beneath them to get up and walk the 4 feet to the nearest trashcan to throw away their crap. I was truly amazed that people here just leave their trays of garbage on the tables and expect other people to clean up after them! When I had encountered this phenomena when I first visited, I just thought that that particular establishment had a lot of slobs but after every Subway, McDonalds, Hungry Jacks (Burger King, not the mashed potatoes), and so forth, I realized Australians must be bred to be slobs or lack common courtesy. Listen up, Aussies, your mother doesn’t work here. I do not want to pick up your half-eaten Big Mac. I do not want my son to touch your discarded fries. Don’t be pigs. Clean up after yourself. Share the post "Australians are slobs"
Organizing my crap We have voted! LOL… remember, you live in Tasmania. Where the family that bonks together stays together and everyone gets an extra chromosome at birth. 😉 The rest of Oz ain’t like that! Uh-oh! My hubby would so have a cow if he read this! LOL! I guess Tassie is like the South in the US…everyone makes fun of it! It was illegal to be gay in tassie not so long ago… so, yes, we treat them differently. Van Diemans Land is where the worst criminals were sent – and not many people choose to move there, so yes, they are known to be inbred!! They know it, they hate it… but as long as they keep supplying great potatoes and great cadbury chocolate – we’ll try to remember to add them on the map of Oz! The one redeeming fact about Taswegians (local term?) is that they can’t really live a lie – everyone knows your business there… so if they do move to the mainland, it is a breath of fresh air to have someone so genuine join in the mix of deceitful city folk! Nope, it’s got nothing to do with being slobs or being Tasmanians. We just treat McDonalds like any other ‘restaurant’ (and I use the term very loosely). 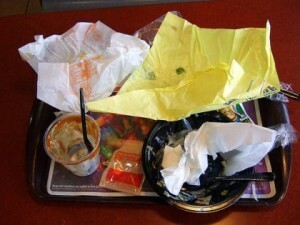 At what other restaurant do you clean up after you’ve eaten? Isn’t that why they have waitstaff? I had the opposite experience to you. When I went to the US I was surprised to see even “hell’s angels” types cleaning up after themselves WTF?? ?